In the two decades since her death, Diana, Princess of Wales, has ascended to the pantheon of the best-dressed women in history, Eleri Lynn, curator of "Diana: Her Fashion Story," which opens February 24 at Kensington Palace told Vanity Fair on a recent phone call. "She is stepping into that same sort of space as an Audrey Hepburn or Jackie Kennedy," said Lynn, "a fashion icon whose style is so emulated and so loved, really." How did she do it? The exhibition, staged in the galleries adjacent to the royal apartment Diana called home, follows the princess's style evolution, from the feather-haired "Sloane Ranger" fiancé of Prince Charles in pie-crust blouses and pastel ruffles whom the press nicknamed "Shy Di," to the sleek and regal woman whose confident stride in embellished gowns and body-con velvet made her one of the most-photographed women in the world. What really set Diana apart was her ability to communicate with her clothing, Lynn explained. "It is very surprising how little footage there exists of the Princess actually speaking. We all have a sense of what we think she was like, and yet so much of it comes from still photographs, and a large part of that [idea] is communicated through the different clothes that she wore." Diana developed a "very glamorous regal style" for overseas trips, for example, that paid homage to the host nation. She wore a dress emblazoned with gold falcons, an emblem of Saudi Arabia, during a trip to that country. This fashion diplomacy clearly reverberates in the legacies of Kate Middleton and Michelle Obama, for example, who often wear clothing that salutes to their guests' home countries. And Diana had an almost uncanny sense for how her clothing might enhance her physical presence, epitomized by what the Princess herself deemed her "caring wardrobe." These were ensembles for the philanthropic visits that cemented her reputation as a world-class humanitarian and a woman of deep compassion. "Cheerful, colorful clothes, because she wanted to convey approachability and warmth," Lynn said. "She didn't wear gloves because she liked to hold people's hands. She would sometimes wear chunky jewelry so that children could play with it, and she never wore hats to children's hospitals after a while, because she said you couldn't cuddle a child in a hat." 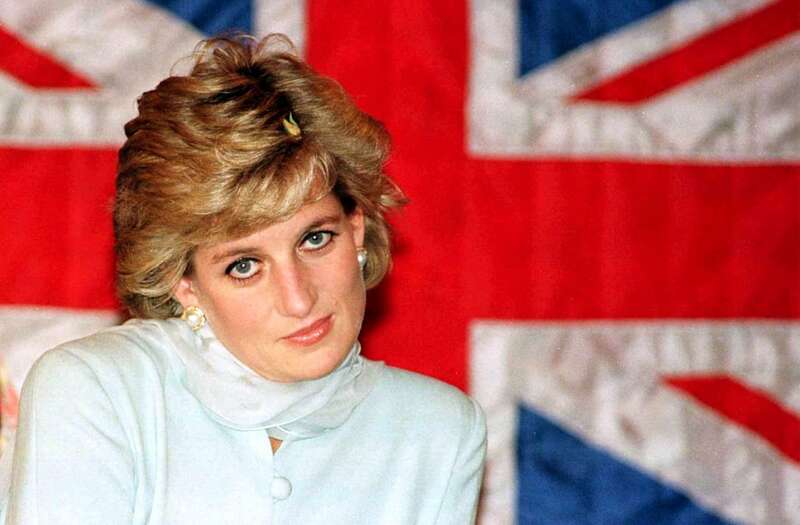 Even textiles were an opportunity for Diana to convey empathy: "if she was visiting hospitals for the blind, she would often wear velvet so that she would feel sort of warm and tactile," Lynn explained. She was also deeply aware of how clothing might shape her public image: "One of her most famous gestures, which is to remove her gloves very conspicuously to hold hands with patients—you know she's using clothing and fashion in order to really hammer home that message." It isn't simply Diana's standards for public dress that made her an icon, however, but the impressive evolution of her style. "What's amazing to me, when you first meet Lady Diana Spencer in the exhibition, you meet her in her debutante dress from 1979," Lynn noted, "and it's very frilly, very lacy, and very far removed from the fashion icon that she would become." In fact, the woman whose career would soon command hundreds of ensembles a year had just three items of clothing in her wardrobe at the time (the rest she borrowed from friends, fellow "Sloane Rangers" with whom she shared an apartment in London's posh Sloane Square and who populated the party pages of Tatler). But Diana was a quick learner when it came to developing a uniform for her new royal role in the public eye, Lynn said: "You really see the frills and the ruffles of her early romantic style disappearing quite quickly, as she realized that didn't work very well for press photographs. It made her look cluttered. So around the 80s you see the silhouette sleek down, and all the decoration becomes surface embellishment." Gone were the gauzy pastel valences of the Bellville Sasson dress in which she famously snoozed at an event at the Victoria & Albert Museum while pregnant with Prince William; in were the form-fitting, even clingy, bodices of Catherine Walker and Victor Edelstein, and the embellished sheaths of Versace. Diana had a knack for choosing pieces that suited her, rather than what seemed of the moment—a particular feat in the trend-driven 80s and 90s. "That's what sort of takes somebody above daily fashion," said Lynn, "and helps make them a fashion icon: they have that elegance that is theirs and doesn't move with the changes of fashion." A mermaid-teal sequin Catherine Walker dress with large shoulder pads looks of the 80s, yet it also echoes the golden age Hollywood costumier Adrien, or the emerald Versace dress Angelina Jolie wore to the 2011 Golden Globes. The Prince and Princess of Wales leaving the Lindo Wing, at St. Mary's Hospital after the birth of their baby son, Prince William. The Duke and Duchess of Cambridge leaving the Lindo Wing of St Mary's Hospital in London, with their newborn son Prince George of Cambridge, one of the ten best moments of the royal couple's five years of marriage. The Duchess Of Cambridge Attends 'A Night Of Heroes: The Sun Military Awards', Imperial War Museum, London. YANDINA - APRIL 12: Diana Princess of Wales and Prince Charles visit Yandina Ginger Factory on April 12, 1983 in Queensland, Australia during the Royal Tour of Australia. Catherine, Duchess of Cambridge and Prince William, Duke of Cambridge arrive at Calgary Airport on July 7, 2011 in Calgary, Canada. LEEDS, UNITED KINGDOM - MARCH 29: Princess Diana visiting Bristol during her pregnancy with her first son, Prince William. Diana is wearing a coat designed by Bellville Sassoon and a hat designed by milliner, John Boyd. Catherine, Duchess of Cambridge laughs as she attends the St Patrick's Day parade at Mons Barracks on March 17, 2014 in Aldershot, England. Catherine, Duchess of Cambridge and Prince William, Duke of Cambridge visited the 1st Battalion Irish Guards to present the traditional sprigs of Shamrocks to the Officers and Guardsmen of the Regiment. EPSOM, UNITED KINGDOM - JUNE 04: Diana, Princess Of Wales With Prince Philip On Derby Day. Princess Diana Is Wearing A Polka Dot Day Dress Designed By Fashion Designer Victor Edelstein. The Duke of Cambridge, Prince William, The Duchess of Cambridge, Catherine Middleton and Prince Harry attend the inauguration, and make an official visit at Warner Bros, Leavesden Studio, London on April 26, 2013 in Watford, England. Diana's whimsy with clothing is also finding new appreciation in a younger generation, who are celebrating her on the runway or on Instagram, whether twirling on John Travolta's arm in a midnight blue velvet Victor Edelstein at the White House or darting into the Harbour Club in spandex shorts and a Harvard sweatshirt. "She did clearly have fun with fashion," Lynn says, "and she took risks . . . and experimented with her style. She was the first member of the royal family to be photographed wearing trousers to evening events. But she often teamed that with tuxedo jackets and bowties—that's quite the bold, fun look that you don't necessarily expect of a princess." But what has made her image even more powerful over time is that she truly knew what looked good on her, Lynn says, which gave her glamour a certain naturalness. "A lot of designers say that she had this look about her that she'd just sort of run in, and run her fingers through her hair," Lynn said, adding that designers also point to "an incredible presence and incredible charisma that lifted her above those seasonal changes." That confidence in her appearance is what makes Diana, not just her wardrobe, iconic. "She had really sort of transcended fashion and achieved an incredible chic and elegance," said Lynn, such that "all you saw was her, and the clothes became secondary to her own presence and her work."